It's hard for me to pinpoint the "biggest" Wrestlemania match of all times. I think for a lot of people different criteria are used in the equation. Star power both inside and outside the ring are the biggest contributing factors to me. Wrestlemania 18 may have had the biggest main event of all time (I know it was the last match on the card, but it was none-the-less the main event), with Hulk Hogan vs. the Rock. 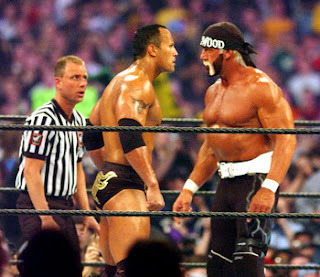 It was 2002, a far cry from the 1980's, when Hulkamania ruled Wrestlemania. The Rock was the up and comer here, but in all actuality, he himself was just over a year away from walking away for an extended hiatus in Hollywood. Hogan was still playing off the nWo high that seemed to breath new life into his character and career. But even the heel Hogan was starting to get stale. The fans knew it, and that night in Toronto, instead of booing the villain, they started to cheer on the Hulkster. On this night, just like Andre the Giant had done for Hogan 15 years earlier, Hulk passed the torch to the younger, stronger, and better superstar. It's a tale as old as time. No matter how big you get in this business, it's essential that you're willing to pass the torch to the next generation. It's up to them to run with it. And we all know that the Rock did. He had been up until that point too. And with the cheering fans, the two celebrated Rock's victory in the middle of the ring and soon Hulk Hogan was back with the red and yellow, retiring the black spandex and bandanna. I suspect we're going to see something similar come out of Wrestlemania 28. It's hard to compare these two matches, because I don't necessarily think the Rock is past his prime (however, he's not a full time wrestler and that's why I think he HAS to put John Cena over) If the Rock is coming back for good, then I don't have a problem with him winning, but for him to get the victory and then go back and make movies and come to the WWE every few years isn't going to do anything for the long term success of the company. Other quick hits from 18, Triple H beat Chris Jericho to once again become the world heavyweight champion. The Undertaker beat Ric Flair and Stone Cold Steve Austin beat Scott Hall. Many of these matches at 18 could have and probably should have been done the previous year after Vince McMahon bought WCW, but remember the big names didn't sign right away with the WWE. Read more here. Thoughts? Weigh in here or on the My 1-2-3 Cents Facebook wall.